Chief Femi Fani Kayode has no "Heart Disease"
"It has been brought to our attention that the Punch Newspaper has reported, in a blazing and sensational headline, that the former Minister of Aviation, Chief Femi Fani-Kayode, "has heart disease". This is false. 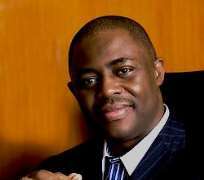 Worst still the story has brought a lot of fear and consternation into the hearts and minds of Chief Fani-Kayode's friends, supporters and family members all over the world. It is only in the world of the reporter of the Punch Newspaper that a "heart-related ailment" has suddenly become "heart disease". Chief Fani-Kayode's lawyer, Mr. Norrison Quakers SAN, said that he had a "heart-related ailment" in open court and not "heart disease". There is a world of difference between the two. He also said that he will be presenting a medical report to the court at a later date. For the Punch Newspaper to misrepresent what was said in court is unprofessional and unexpected of a newspaper of such high calibre and repute and which we ordinarily hold in high esteem. Secondly it is not true that Chief Fani-Kayode had asked the court and got two previous adjournments in this case. The court records are there for all to see. Today was the first and only time that Chief Fani-Kayode has EVER been absent from the proceedings at the Federal High Court in Lagos or asked for an adjournment from this particular learned judge. He looks forward to being in court at the adjourned date and he fully appreciates the fact that the EFCC did not oppose the application for adjournment and that the learned trial judge granted it expeditiously. We feel it is important to make these clarifications for record purposes". (S.S.A. Public Affairs to the former Minister of Aviation, Chief Femi Fani-Kayode).